2 or 4 MG? BTW what are those spikes under the chassi? Currently, the Peruvian army has some old tanks and just recently (1937) took delivery of a smallish number (approximately 70) WW Panzer IIIs. The prior government paid for another 2 shipments, but the manufacturers are pretty busy so they won't be arriving until the end of 1937 and the middle of 1938. Thanks!! The spikes are a detail I see on a lot of armoured car design, I've found for insperation. but I'll remove it too. I was thinking on browing M 0.5 call machine guns. but what is a good choise 2 or 4? So no need for a new tank? Why buy a crappy Panzer III when you can buy the awesome and powerful Type 89 tank. ... that actually looks like a wheelie bin... Never mind what I said. Definitely better. I think it looks quite big though. I put together a quick 4x4 version which I thought looked a bit better. Sorry, I meant a four wheel drive version, i.e. four wheels in two pairs - one at the front and one at the back. What 4x4 means in this case is four powered wheels out of four total wheels. The current design (which looks potentially quite useful) is 6x6, assuming all wheels are powered. Sorry Guys, Something I think on a other way by English.... But I understand know, Thanks Friend!! I'll update the drawing. You do you have save it a .JPEG? But are you sure the gun won't be too heaye for the chassi? The Germans use 6 wheels too! Depends on what you're using for guns. The Germans had 4, 6 & 8 wheeled armored cars, all armed with a 20mm cannon and a 7.92mm MG, the 8 wheeled cars were the only ones that got the heavier weapons (50mm & 75mm cannon and 75mm howitzers). 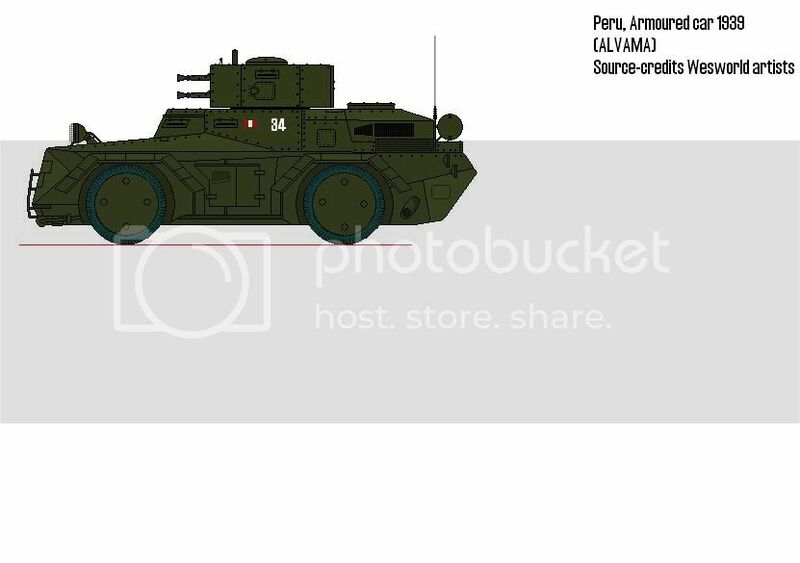 By the look of the picture, I'd GUESS (but I could be wrong) that the guns shown for the Peruvian AC are rifle-caliber machineguns, not cannon of any sort, so 4 wheels will be fine for the recoil.